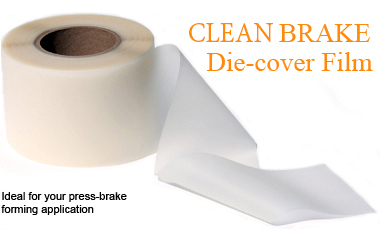 "I saved hours of refinishing work every week once I started using CLEAN BRAKE die cover film. The payback was immediate and my guys were working on other paying jobs instead of fixing a repeat problem." 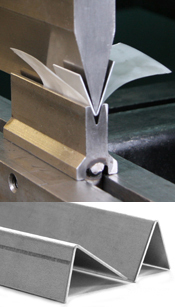 Note: Die marks form on the outside show edge when formed with steel dies. die-cover film produces an unblemished form every time. urethane die-cover film makes your shop more efficient and profitable by eliminating die marks made from your existing metal dies. CLEAN BRAKE urethane die-cover film forms a soft durable barrier between the pressure points of the brake punch and die eliminating the scuffing from metal on metal contact. Typically the length of the die contact area is covered and then the press operation continues as normal. Thicker versions of CLEAN BRAKE are used for heavier gage applications.